The 411 The East End has traditionally been an issue for me. Brunch places tend to be only your standard eggs and bacon spot; nothing fancy or healthy just the usual spots with menus that don’t inspire. But now, there is a bright light in the East and that beacon comes from Masson street. Here, you will find new brunch spots popping up that aren’t your everyday standard fare. 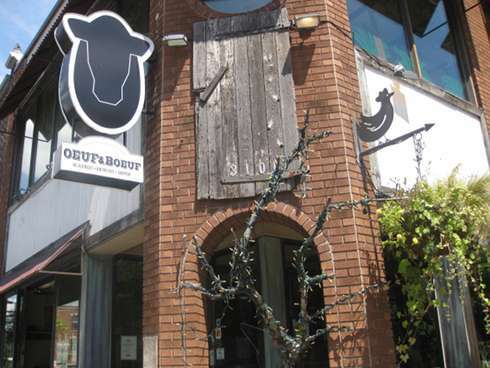 With two floors and ample seating area, a kids play area and a weeklong brunch, Oeuf et Boeuf is a midpoint between the 7 day a week classic breakfast spot and a spot were you can get some tastier and fancier dishes than your normal eggs and bacon. 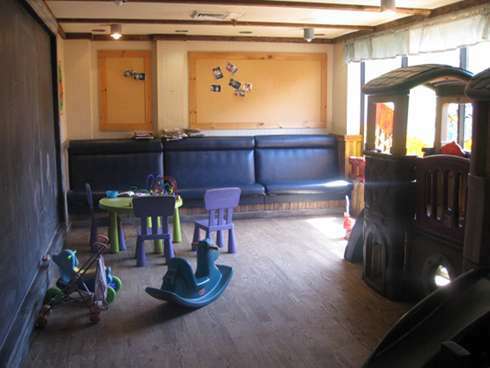 The top floor has a brilliant concept of a kids playroom full of toys making for a family friendly environment while the downstairs a has a nice rustic inspired décor and some drink options with alcohol in them that adults can enjoy. 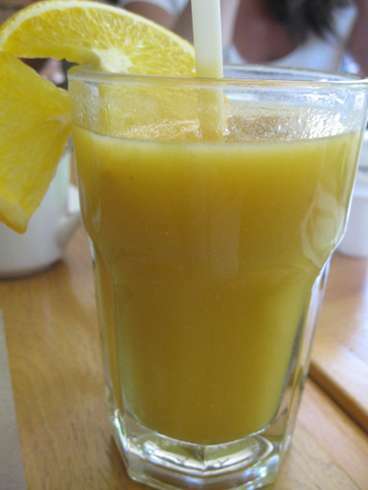 We started with a juice nectar ($3.95). This drink was fresh, tasty and thick – really thick. In fact, it passed the straw test where a straw stood upright on it own with only the help of the thickness itself. One of the dishes ordered was the eggs Benedict maraicher ($12.95) which is a brilliant gluten free option with an eggplant slice as the base instead of an English muffin. 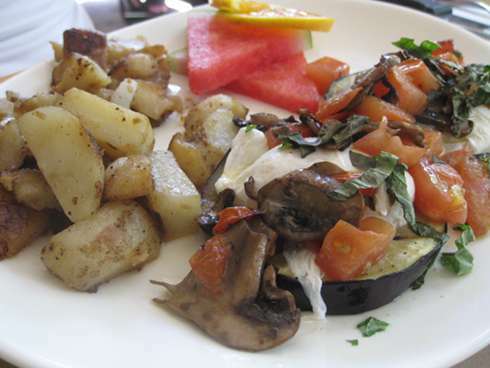 It was topped with a poached egg, tomatoes, and mushrooms and also came with a side of potatoes and fruit. The Ramekin Aloha ($11.95) is a pot with cheese, pineapple and eggs. 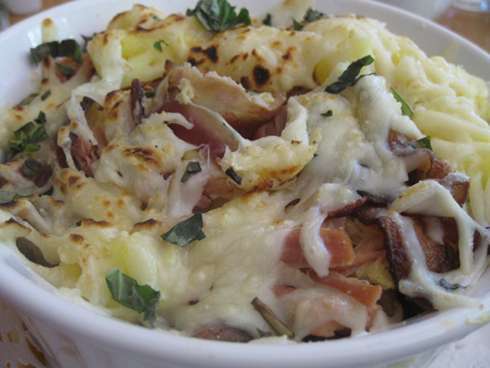 The pineapple may seem like a random addition to the dish but it works remarkably well. 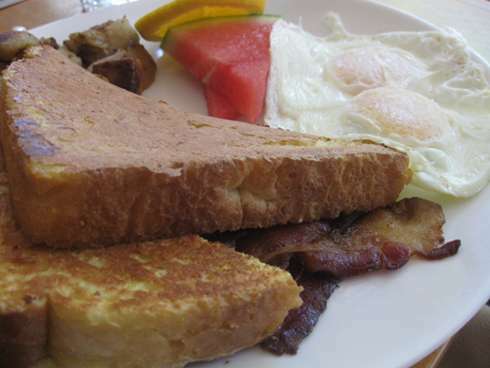 The combo dish Fleur Oranger ($11.45) is a combination of French toast, eggs, bacon, fruit and potatoes. The French toast slices are quite thick; the potatoes were good and a fair portion, at that. This dish was a good classic dish for a decent price considering you get coffee as well. Our waiter was helpful and checked up on us without rushing us out. The menu has many vegetarian options and at least one gluten-free option – and tasty ones, at that; especially the maraicher which is a wonderfully creative creation with eggplants instead of English muffins. Overall, I liked Oeuf et boeuf based on the fact that they have a kids section where they can actually play in, that it’s open 7 days a week and that the prices are fair. As places to go in the East End of Montréal, I think people should definitely check it out as it does a good job on taking classic dishes and bringing them to life with a twist.